Over the years since I first ran it, I’ve made a few iterations of my narrative (large-)party game San Tilapian Studies. It’s also been run by other people with their own versions of the stickers and text, and even been made available to the public at the Wellcome Play Spectacular. In 2015, I offered a version of it as an IF Comp prize, and the winner requested that I adapt it to a particular fantasy world idea he had in mind. That version was mechanically pretty similar to the original — partygoers are given stickers with nouns or descriptive phrases on them, and must find other participants that are a good match for them in order to make a three-segment-long description of an object. Then they make up some backstory about that object and write it in the book. This year I offered the San Tilapian Studies kit again. One of the winners requested the original version, which is cool — it’s fairly easy for me to do that, and I think the Ruritanian romance setting provides a lot of room to imagine different miniature plot lines: love stories, politics, military affairs, interpersonal intrigue, etc., all fit into that world. The other winner asked for a Lovecraftian re-skin of the set, and that was a bigger revision. The rest of this post is about the design work I did to adapt San Tilapian Studies, first for a minor upgrade and second for a larger re-skin. While the result isn’t played on a computer, this is an exercise in developing a corpus for procedural use. Designing, testing, and editing a corpus is in fact a significant part of the work in any procedural text project — so while this is a bit different from, say, Annals of the Parrigues in that it doesn’t result in a finished single text, a lot of related issues come into the corpus design. In a previous post about narrative structuring, I promised a followup about stories based on card decks — not simply the card metaphor that Failbetter uses in StoryNexus, but actual physical decks, sometimes accompanied by rules. I’ve covered a few narrative card games here before. Gloom is a popular card game about Gorey-esque horrible events, in which you accumulate misfortunes for your characters until at last they die; each event is named briefly on its card, like “attacked by ducks,” and it’s up to the player to describe how this fits into a larger sequence, if at all. Some players work harder on their narration than others. Gloom has a number of expansions and spin-offs at this point, including a Cthulhu version and a fairytale recasting. 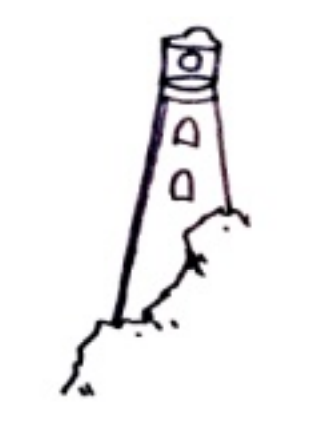 There are also a few features in Gloom designed to encourage continuity, symbols on some event cards that determine whether later events can be played, but in general any chains of causality are invented by the players at game time, rather than baked into the rules or the behavior of the deck. And because Gloom is emulating a type of story in which one bad thing arbitrarily happens after another, there also is not much attempt to guarantee a well-paced story arc. Once Upon a Time is light in both writing and mechanics: it’s a sort of trope toolkit that the players can use to stick together stories, so that your card might just say “Brave” and leave it up to you how the concept of bravery applied to a character in the story will enhance what is already going on. Or there are Story Cubes, which are dice with trope-y images on them. The line between game and brainstorming device is pretty thin here, though, and I wouldn’t accuse either Once Upon a Time or Story Cubes of actually being or having a story already in any meaningful sense. Meanwhile, there are also aleatory traditions of literature to consider here: Marc Saporta’s Composition No. 1, a book in a box with unbound pages, to be read in any order; BS Johnson’s The Unfortunates, with chapters the reader may reorder. Nick Montfort and Zuzana Husárová have written about shuffle literature in more depth, including those works and several others. So it is in light of those various traditions that I’m going to have a deeper look at two particular card narrative games that recently came my way: Jedediah Berry’s The Family Arcana, and the USC Game Innovation Lab’s Chrono Scouts. So far I’ve had time to look at Evita Sempai, Harmonic Time-Bind Ritual Symphony, and Standoff. 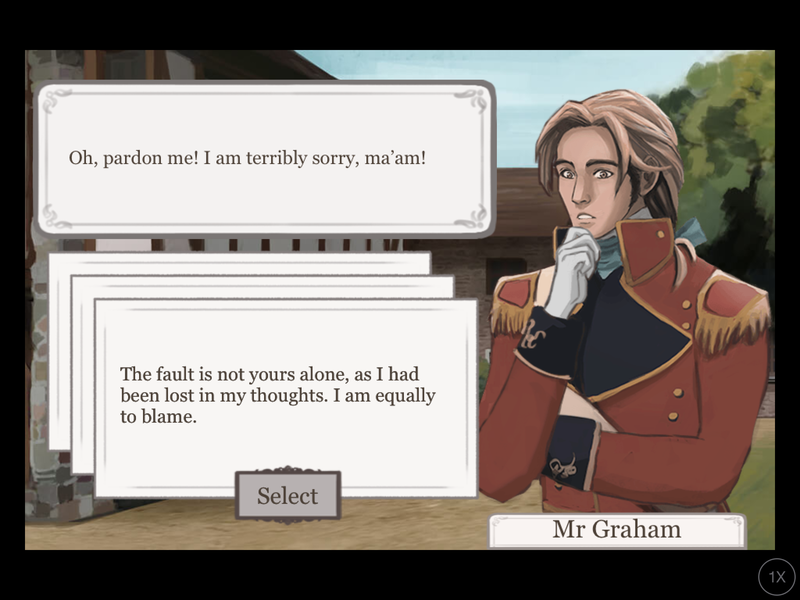 Regency Love is an iOS game set in a pseudo-Austen town; it is in the same general territory as a dating sim or visual novel, but with a structure that also owes something to roleplaying games. The core interaction loop is that the player can select a place from the map of Darlington, their town; the place may yield one or more possible activities. The activities can either be quizzes about Regency life (how long should you properly mourn a sister? how much did muslin cost?) or social interaction scenes that are primarily dialogue-driven. From time to time, there’s an opportunity to do another quiz-like activity, a game of hangman in which you’re trying to fill in a missing word from a famous quotation, mostly from Austen. 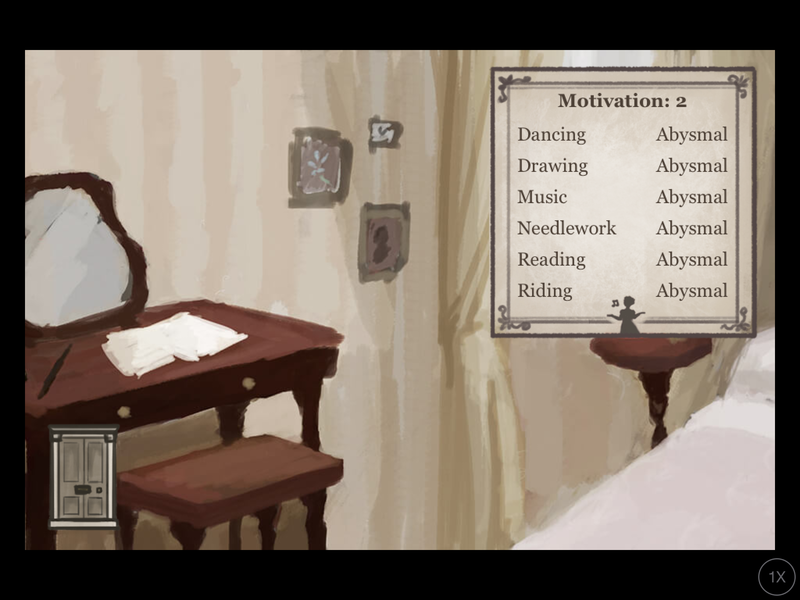 Doing quizzes and hangman gains you motivation points which you can spend to raise your skill in one of six “accomplishments” — drawing, needlework, reading, dancing, riding, music (harp and pianoforte and singing are not distinguished). Some of the social activities depend on you having a certain accomplishment level in a certain area before they will unlock. Other social events depend on what has already happened. Using a map to pick the next little story you want to participate in also reminded me a bit of StoryNexus, though whether the underlying engine relies on anything like quality-based narrative, I have no idea. Before the game began I evidently paid NO attention to my governess. I was never a great enthusiast for the quizzes and stats part of this game. The questions refer to information from Austen that is not provided internally, so you either already know the answers or you have to guess. There aren’t enough hangman sentences and quizzes to last the whole game, either, so you’ll see the same things repeat over and over again before you’re done. Meanwhile, your accomplishments are necessary enough that you can’t ignore this part of the system, but there’s not enough variety to what the stats do to make it an interesting choice which one you raise next. Somewhere between halfway and three quarters of the way through play I had maxed out all my accomplishments and could now afford to ignore the whole quiz-and-hangman ecosystem, which was a relief. Based on your behavior, the game also tracks character traits, reflecting whether you’re witty, dutiful, etc. It displays what your traits are, but I never worked out exactly what was moving the dials. What I said in conversation must come into it, but I didn’t know which dialogue did what. Nor did I ever figure out how it mattered. Some events were plainly closed to people with less than 12 Needleworking, but I never saw an explicit flag that excluded people who weren’t witty. So the character trait system may have been doing important things, but it was opaque enough that eventually I started to ignore it. What does that leave? Talking. Lots and lots of talking. I like talking games! This one made some slightly peculiar choices, though. The rules begin thus: “A Wish for Something Better is a single-player roleplaying ritual.” This is a work with light rules, designed to be played alone. It is meant to create a place of imagination in a focused way that serves the player’s emotional needs, a way of imagining specifically rather than vaguely what escape or comfort would look and feel like. You name something that you’re not currently happy with, and then imagine what could be added to your imaginary sanctuary that would reverse that feeling. Is it a roleplaying game? It’s certainly a world-building exercise, and to the extent that you’re projecting yourself into this other place, maybe that’s roleplaying. And some roleplaying games certainly edge across the border between game and ritual. Avery McDaldno’s Brave Sparrow and Teen Witch come to mind. There are elements of “A Wish for Something Better” that suggest a spellbook, though these are primarily about setting a mood, lighting candles and making a thoughtful space. Contrast @LilSpellbook, a bot by Harry Giles that offers rituals like “A spell to iron clothes: crumble your yearning’s name and fenugreek while dancing, and touch it to your forehead.” or “A spell to bring laughter: pulverise a weighty bond, and rub into your chest.” Half the time these seem freighted with metaphor in a plausible way; the rest of the time, not so much. Because this thing is so personal, it’s hard to describe too much what it is like to play. So I’ll simply say this: I found that part of its effectiveness lay in helping to distinguish the things I could reasonably hope to do something about, and those I cannot; for some of my concerns there is no fix I could possibly execute, and therefore the only way to furnish my imagined space was to place reminders of my own limits.